Rain proved to be an enormous factor Friday night in the Bronx. The reason why; it forced an early and unwelcomed appearance once again by the Yankees bullpen. The lengthy delay effectively chased starter Jordan Montgomery from the game after 4 ⅓ innings of solid work. In the sixth inning, a combination of Tyler Webb and Tyler Clippard allowed the Brewers to quickly tie the game at four runs. Unfortunately, that was only the beginning of the terror to come once again in the late innings. Clippard’s 7th inning was the stuff of nightmares for Yankees fans everywhere. He walked the bases loaded before allowing Jesus Aguilar to wallop a long two-out grand slam. It was a slow, grueling experience to watch this inning unfold in the worst possible way once again for the Yankees. 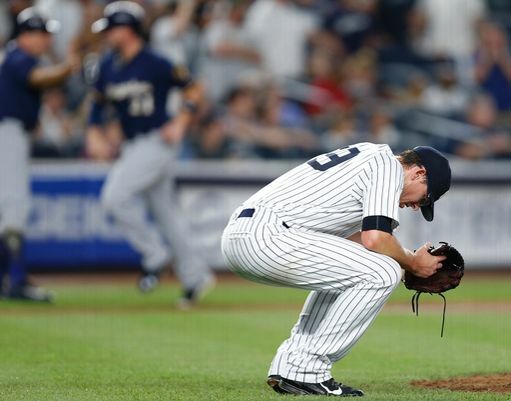 In an instant, the Yankees had lost another chance to win a close ballgame and instead faced a 4 run deficit. The 2017 edition of the Yankees bullpen has become so bad that it’s almost hard to put into words. It is absolutely horrifying to watch them single-handedly destroy Yankee leads multiple times a week. They consistently hand out free passes to opposing batters as a result of the inability to be around the strike zone. Once runners are on base, they seem to never make any of the big pitches needed to put out the fire. It’s gotten to the point where the atrocious performances are no longer surprising to fans, they are expected. Joe Girardi needs to face serious heat for his bullpen decisions. Tyler Clippard has clearly been melting down for weeks now, yet Girardi still carelessly hands him the ball tonight in a critical situation once again. This is simply unacceptable. Girardi needs to stop bringing Clippard into games that are even remotely close until further notice. End of story. On a positive note, Aaron Judge continued his unbelievable rookie campaign by smashing a pitch off the restaurant window in dead center field for his 30th HR of the season. The numbers Judge has continued to produce this season, even as other Yankee players around him have been begun imploding, is simply amazing. 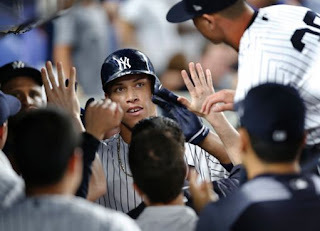 It is hard to imagine a scenario where a team could commit five sloppy errors in the field and still find a way to win a baseball game by a comfortable margin, but the Yankees found a way to make it happen Friday night for the Brewers. Tomorrow, the Yankees will look to bounce back from this deflating loss at 1:05 P.M, by handing the ball Luis Severino (5-4, 3.52 ERA). Milwaukee will send out Brent Suter (1-1, 3.00 ERA) in hopes of extending their first place lead in the N.L Central division. Hopefully Severino can pitch deep into the game tomorrow afternoon and save Yankees fans the pain of watching more of the circus that is the Yankees bullpen.